The morning of November 7, 2016 was a rude awakening for millions of Americans – 231, 556,622 Americans to be exact. This was the approximate number of eligible voters who did not vote in the presidential election. In fact, if each of these 230 million plus people collectively wrote in a hypothetical candidate’s name on a ballot, that candidate would have won the election by a landslide. More alarming is the fact that Black voter turnout declined for the first time in 20 years in a presidential election after it had just peaked at 66% in 2012. Political pundits may have used the two years since the elections to argue and dissect what happened, but organizers knew what we needed to focus on was how to ensure it never happened again. This go around, we’re doing things differently. NAACP has launched a civic engagement campaign to increase Black voter turnout, not just in the 2018 midterms, but in the years to come. The message behind this campaign is simple: Vote! Our lives depend on it. At the genesis of this campaign is research. We talked to real people about real issues, and their very real concerns heading into the ballot box. Much of what’s happened over the last two years, both in federal policy and in day-to-day life, has resulted in the undervaluing of Black lives. The numerous #LivingWhileBlack incidents, the uptick in hate rallies, the attempted rescinding of DACA, the racist remarks spewing out of the White House, and even the Facebook hacks that pitted people of color against the rest of the country, have shown that this campaign is necessary to mobilize Black Americans. In addition to investing funds into this campaign, as the leader and coalescing advocate for the Black community, NAACP is bringing together other social justice organizations to partner on this mission to register and turnout a record number of Black voters. 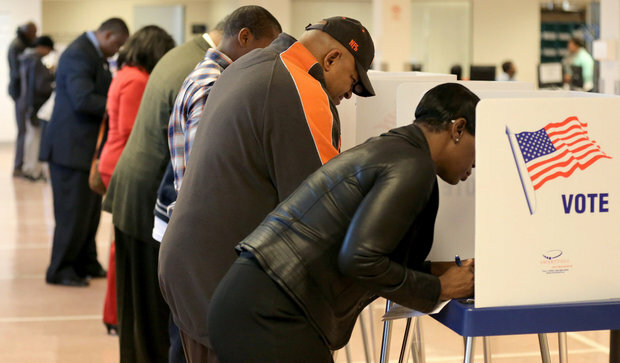 NAACP has also expanded its civic engagement department to be one of the largest in the organization, and for the 2018 midterm elections, has identified six key states where the Black vote will make a particularly impactful difference: Florida, Georgia, Michigan, North Carolina, Ohio and Pennsylvania, each with a corresponding State Director or advisor for civic engagement. Why did we pick these six states? Research. We looked at the political climate in the country, and we partnered with GSSA, LLC, a Colorado data analytics group, to pinpoint where we can make the most difference. As it stands on November 6, Floridians will have a remarkable 12 initiatives to vote on, including one on the restoration of voting rights for felons. Georgia may or may not make history as the first state to elect the nation’s first Black female governor. In Michigan, a ballot initiative proposes automatic voter registration for all eligible voters in the state. North Carolinians will have the opportunity to vote on whether identification must be presented in order to vote – an initiative NAACP is adamantly against. Ohio and Pennsylvania, two states which played a critical role in electing President Trump, will have to reckon with their 2016 decision, and either vote along party lines or cause a seismic shift. Over the next couple of weeks, our State Directors will be reporting back about their progress in these states. Stay tuned to our blog section to see how we’re turning out the Black vote.